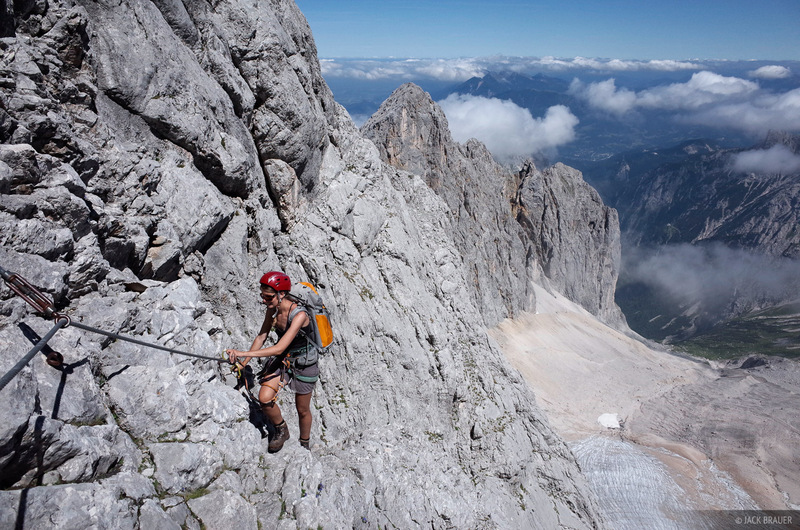 A month ago when Claudia and I summited Muttekopf peak in the nearby Lechtal Alps, we saw the impressive Wetterstein massif off in the distance and I immediately thought “What is that??! !”, followed soon after by the next thought “I want to go there!” We did, in fact, spend a few days then in the town of Ehrwald under the Zugspitze, but poor weather shut down any chance of climbing the mountain. 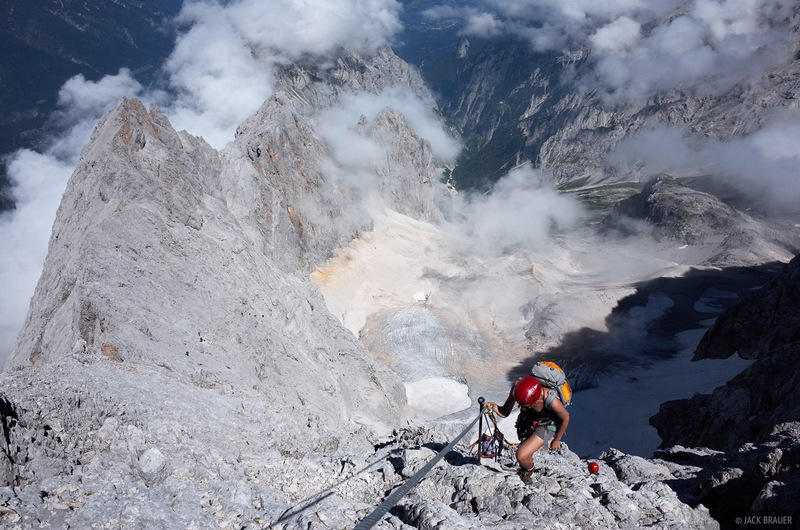 So, last week we returned to the area and climbed to the summit via a fantastic klettersteig (cabled, aka via ferrata) route, and we even spent a night on the summit to catch a wonderful sunset over the clouds! Mittenwald, Germany, with the Karwendel mountains rising above. 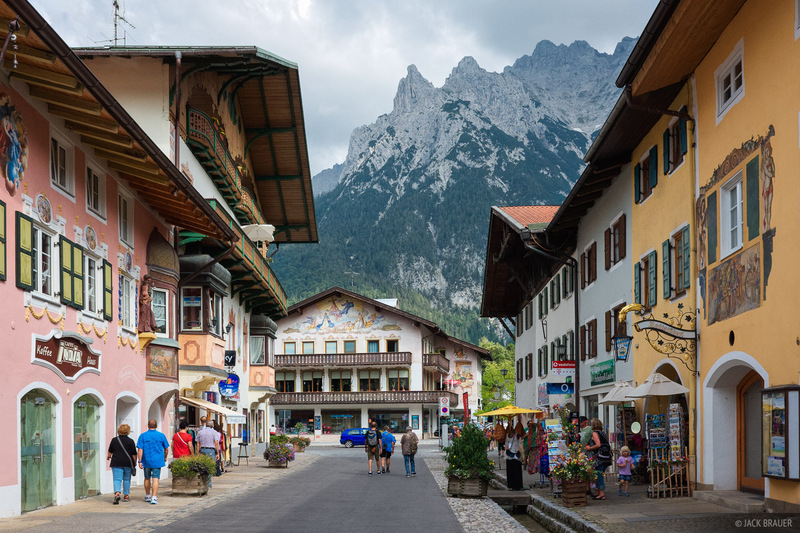 This time we based ourselves in Mittenwald, a quaint little touristy Bavarian town with the Karwendel mountains rising steeply above. 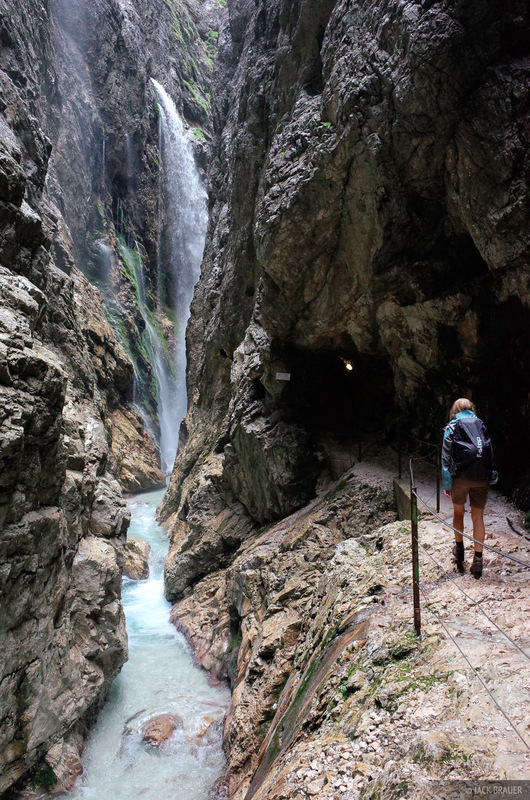 The Höllental route we took up Zugspitze is considered the most classic route; it started by taking us through the impressive (and wet) Höllentalklamm gorge. This long, deep gorge would be completely inaccessible if not for the series of tunnels, bridges, and walkways built along the sides. 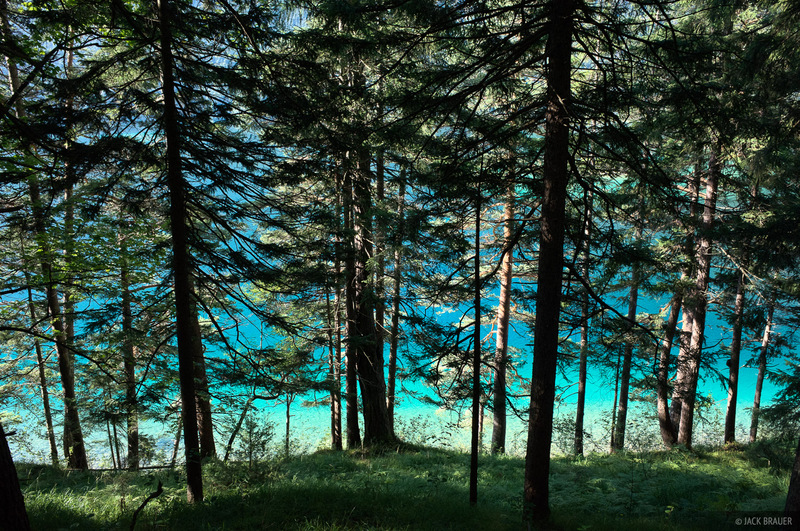 It reminded me quite a bit of the Box Canyon back home in Ouray, only longer and with turquoise water running through. 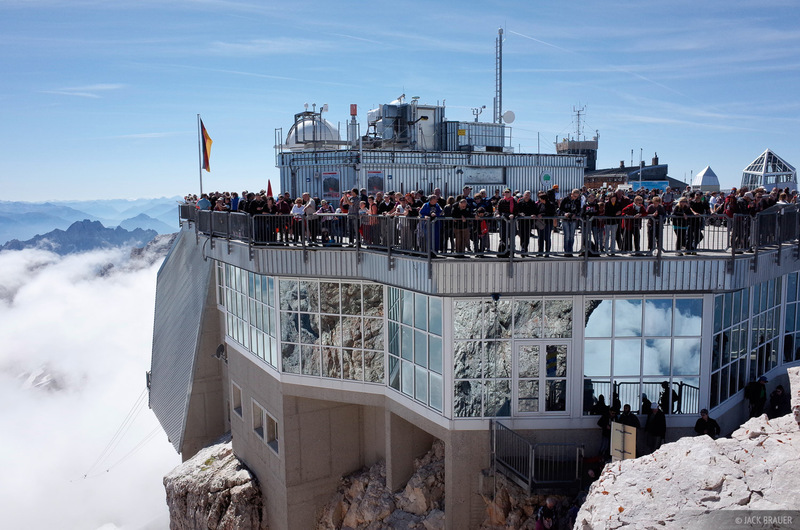 Anyhow, of course pretty much everyone at the hut had plans to continue up to Zugspitze in the morning. Still, we were surprised when everybody woke up at 4:45am to get going! 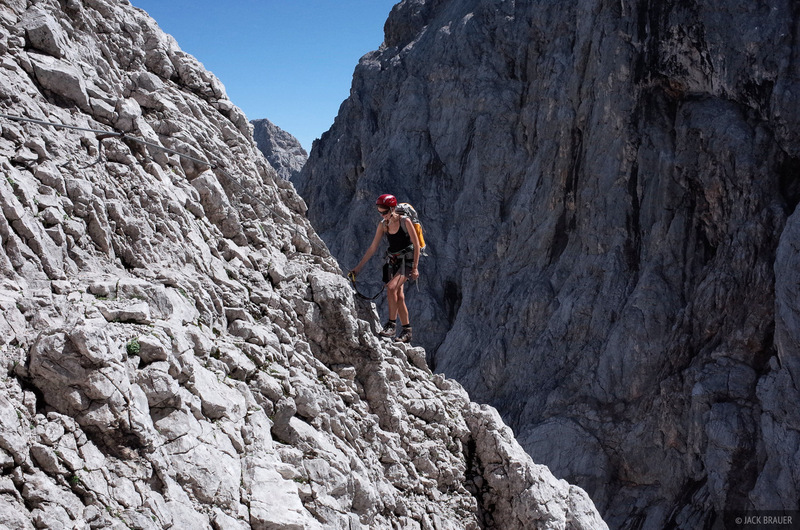 The Höllental klettersteig route to the summit is known for having traffic jams, and probably everyone thought they could get a head start on the crowds by starting so early. Funny thing is – they were the crowd! We slept in until 9:00, long after everyone else had left, and we ended up having a pleasant climb up the entire route with no crowds and no waiting! Score one for the laid-back strategy! Crossing the famous “Brett” pegged walkway. Hiking over the small lingering glacier. 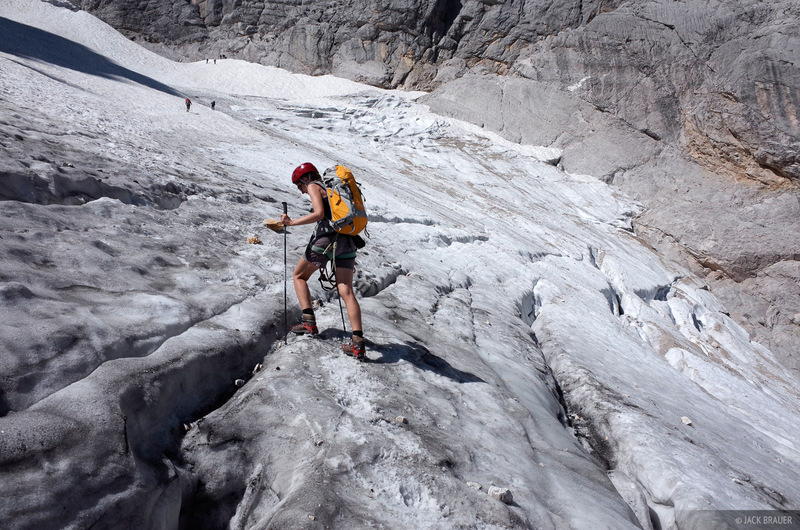 Little crevasses here; no problem… though the crampons we rented definitely came in handy here. 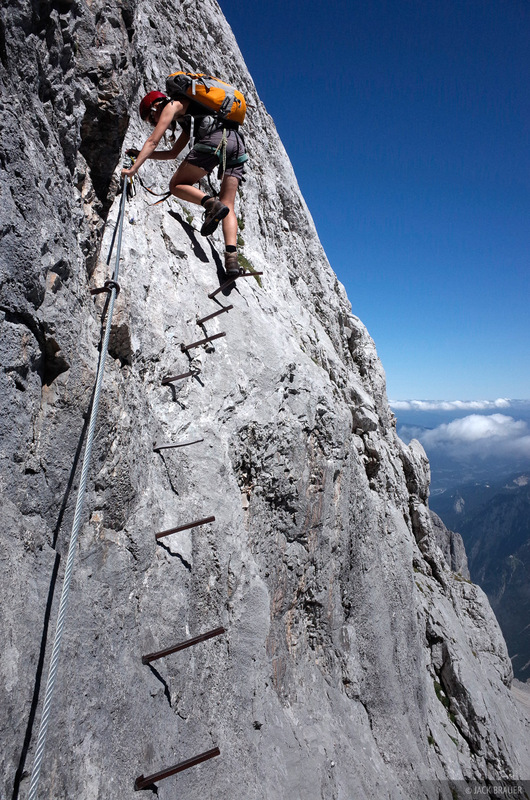 Though not too technically challenging, the Höllental klettersteig route is long and very aesthetic with its massive vertical relief. The route we took involved a whopping 2,200m (7,200 ft) vertical rise from trailhead to summit! 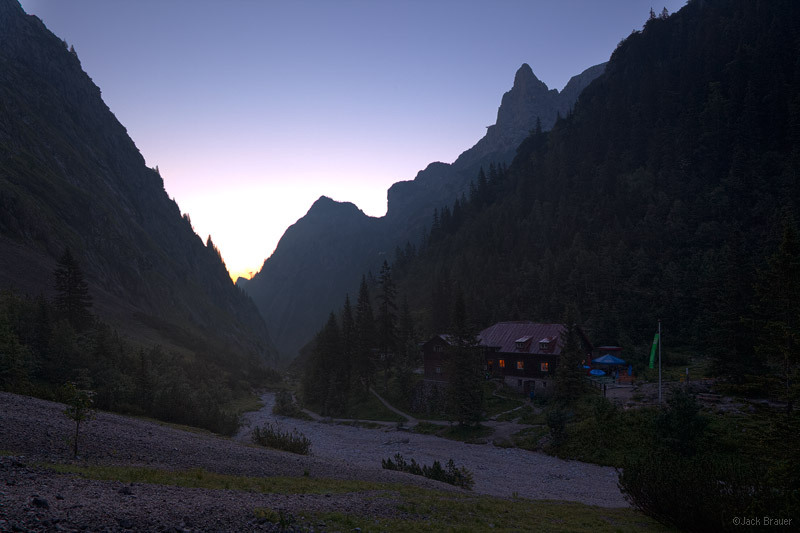 The first day through the Höllentalklamm knocked off 2,000 vertical feet, leaving over 5,000 feet for the second day. 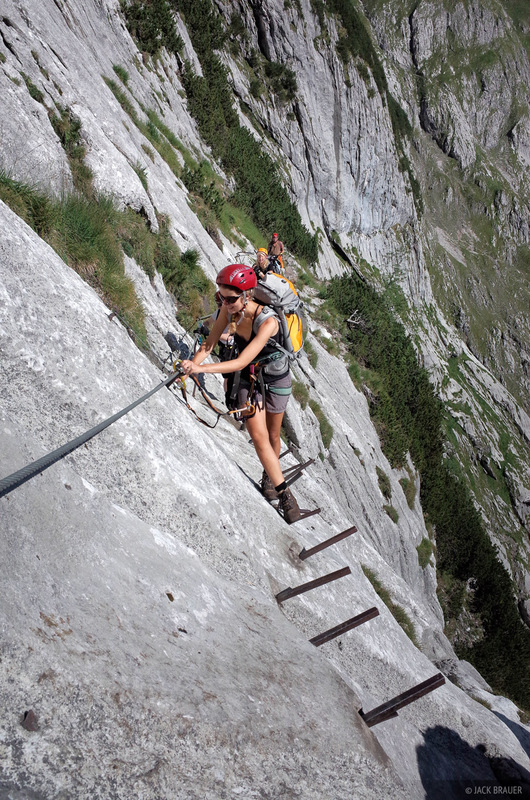 We’ve noticed, however, how the vertical elevation passes by so much more quickly when climbing rather than regular hiking. The whole climb didn’t feel like 7,200 feet; but I checked again and that’s right! By the time we neared the top, we were getting a bit worn out, to be sure. But the feeling of sheer height over our surroundings was quite exhilarating! …hundreds of tourists looking at us! Quite a shock after such a long quiet climb on the mountain. The summit of Zugspitze is the most ridiculous mountain summit I’ve ever seen – with not one, not two, but THREE trams to the top! Oh, and if you don’t prefer trams, there’s also a cog train that runs through the mountain to the top too. The entire summit is covered in cement and buildings, and has more of a feel of a busy train station than an alpine summit. Maybe this should not come as a surprise since Zugspitze translates literally to “train peak” (though the name actually probably comes from a term for avalanche chutes, as a linguistic expert we met at the hut explained). In any case, the peak has a rich history including the summit trams – the first of which was built in 1926. Anyhow, the day we arrived there were over 6,000 tourists at the top! 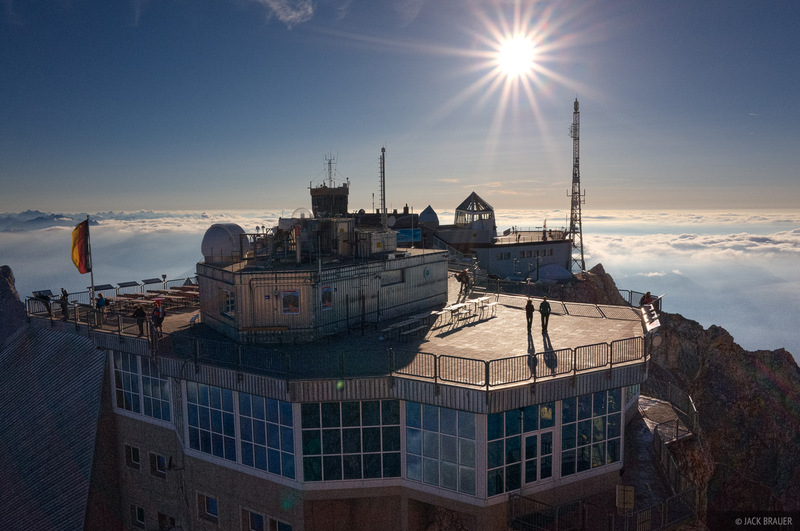 Fortunately we were able to secure a bed in the hut despite not having reservations, and once all the tourists left after the last tram down, the summit station finally became a quiet place to enjoy the vistas. I was super happy to be able to spend the night in the summit hut, since it was a crystal clear evening after the previous rainy days and the valleys were filled with clouds far down below. We enjoyed a wonderful sunset, moonrise, and sunrise the next morning before hopping on the tram for the quick ride back down. 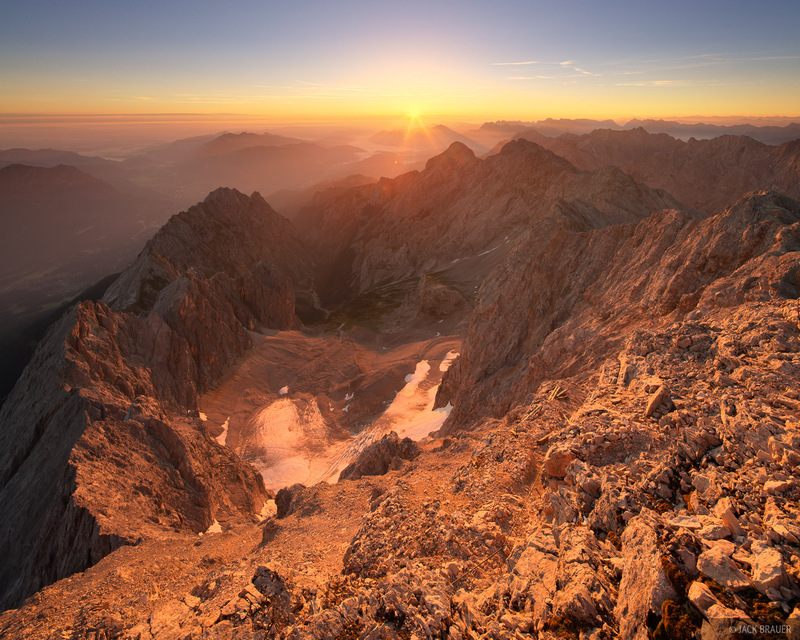 Sunset light as seen from the summit Zugspitze (2962m), the highest mountain in Germany. 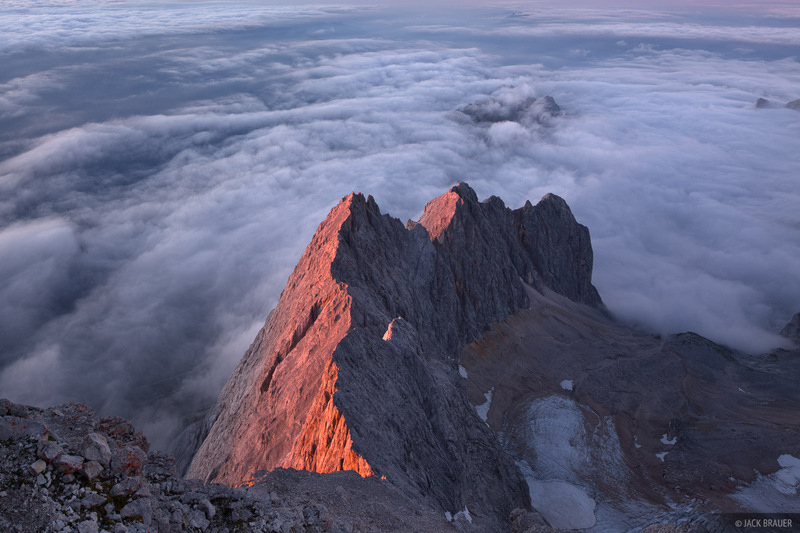 Sunset light on a rugged ridge of Zugspitze, high above the clouds. 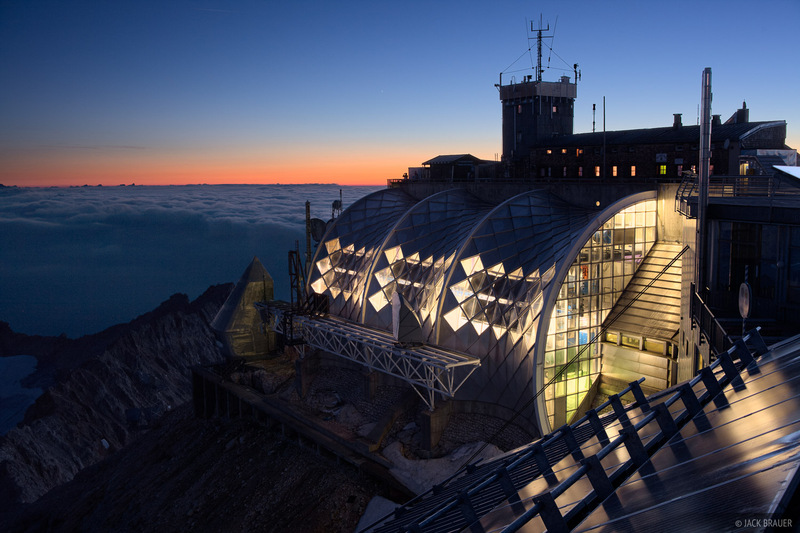 The "James-Bond-esque" research station on the summit of Zugspitze, the tallest mountain in Germany. 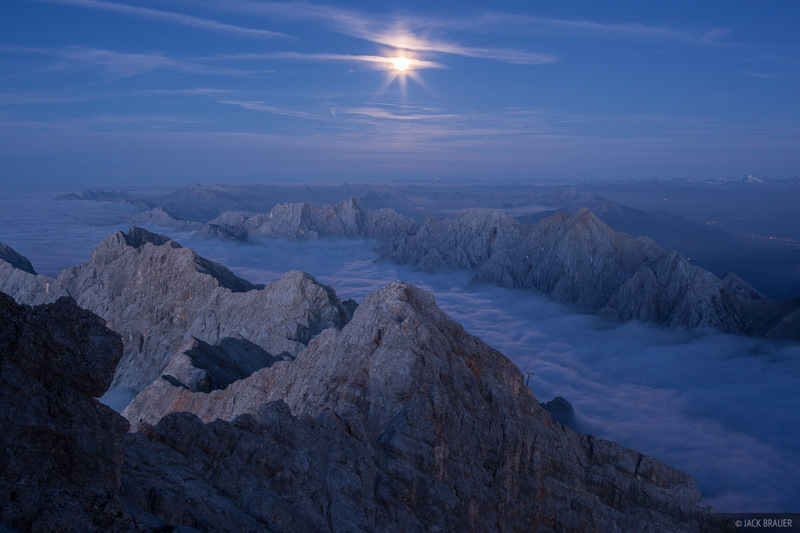 The moon shines above the clouds as seen from the summit of Zugspitze (2962m), the highest mountain in Germany. 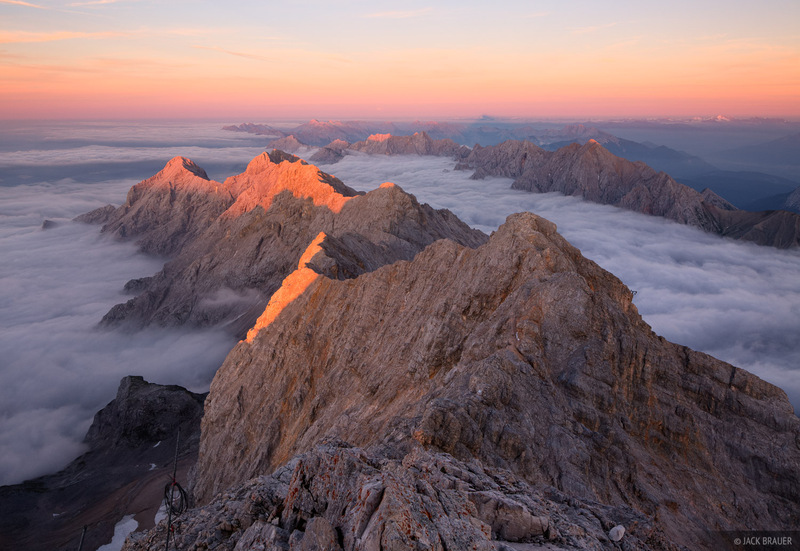 Sunrise on the top of Zugspitze (2962m), the highest mountain in Germany.